Ernest Ewen (Pat) Ashdown. Image courtesy Sydney Mail. The seventh of nine children, Ernest Ewen Ashdown was born in Mackay in 1888, where his father Edward Parker Ashdown was the manager of the local branch of the Commercial Banking Company of Sydney. Edward was later transferred to Newtown, then Inverell and later Bega. In April 1899 he was appointed manager of the Orange branch, a position that he held until his death in March 1909. Ernest, also known as Pat, was the first of four Ashdown boys to enlist in WWI, doing so in Liverpool in January 1915 at age 26. A private in the 13th Battalion, Ernest embarked from Sydney in March 1915. In August 1915 Private Ashdown was wounded in action at Gallipoli, sustaining a gunshot wound to the right knee. He was evacuated to Malta and later transferred to the 3rd London General Hospital in England. 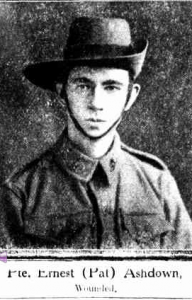 Private Ashdown returned to Australia in March 1916 and was discharged from the AIF in August the same year. In 1944 Ernest married Doris (Doll) Thelma Park at Mosman; the couple later settled in Manly. Ernest died suddenly at Balgowlah Golf Club in August 1949; he was 61 years of age. Three of Ernest’s brothers and one of his sisters also served in WWI: Cecil Parker and Edmond Arthur were killed in action in France in July 1916 and April 1917 respectively, Clive returned to Australia in August 1918; Staff Nurse Maud Ashdown was discharged from the Australian Army Nursing Service in March 1917. Ernest Ewen Ashdown is commemorated on the Holy Trinity Church Orange Honour Roll, where his father had been a church warden, the St Clement’s Church World War 1 Roll of Honour and on the south face of the Mosman War Memorial. This entry was posted on March 21st, 2016.